Friday, November 9th, 2018 at 7:30 PM at the Marina Civic Center. Night Ranger has earned widespread acclaim, multi-platinum and gold album status while leaving their indelible mark on the music charts with a string of best-selling albums, its popularity fueled by an impressive string of instantly recognizable hit singles and signature album tracks. DENNIS DEYOUNG is a founding member of STYX and the lead singer and writer on seven of the bands eight Top Ten Hits. DENNIS is a legendary singer, songwriter, keyboardist, composer and record producer with a career spanning over 40 years. His voice is one of the most recognizable in the music world today and continues to inspire new generations of fans. THE ORIGINAL VOICE....ALL THE CLASSIC HITS….ALL THE MEMORIES....ONE UNFORGETTABLE EVENING. Downtown Panama City is home to the Marina Civic Center and has brought some of world's finest performances to our wonderful community. The facility is modern and offers plenty of amenities, a 2,509 seat theatre, fully equipped stage, and industry standard sound & lighting systems. Free public parking is available in the parking lots surrounding the venue, as well as, across from, behind & nearby the venue. Handicap accessible parking is available in the parking lots surrounding the venue, on either side (North & South Lots). Night Ranger has earned widespread acclaim, multi-platinum and gold album status while leaving their indelible mark on the music charts with a string of best-selling albums (Dawn Patrol, Midnight Madness, 7 Wishes, Big Life and Man In Motion), its popularity fueled by an impressive string of instantly recognizable hit singles and signature album tracks. Producing legendary hits such as “Sister Christian”, “Don’t Tell Me You Love Me”, “When You Close Your Eyes” the anthemic “(You Can Still) Rock In America”, along with "Sentimental Street", "Goodbye", "Sing Me Away", "Four in the Morning" and more. The band was also one the the first big "video" bands, with over 10 number 1 videos on MTV. DENNIS DEYOUNG is a founding member of STYX and the lead singer and writer on seven of the bands eight Top Ten Hits. His live concert with six piece band showcases all the STYX Greatest Hits spanning the 70’s, 80’s, and 90’s. The set includes all eight top Top 10 hits including LADY, BABE, COME SAIL AWAY, TOO MUCH TIME ON MY HANDS, BEST OF TIMES, MR. ROBOTO plus Classic Rock Anthems RENEGADE, BLUE COLLAR MAN, SUITE MADAME BLUE, ROCKIN THE PARADISE and more. DENNIS is a legendary singer, songwriter, keyboardist, composer and record producer with a career spanning over 40 years. His voice is one of the most recognizable in the music world today and continues to inspire new generations of fans. THE ORIGINAL VOICE....ALL THE CLASSIC HITS….ALL THE MEMORIES....ONE UNFORGETTABLE EVENING. 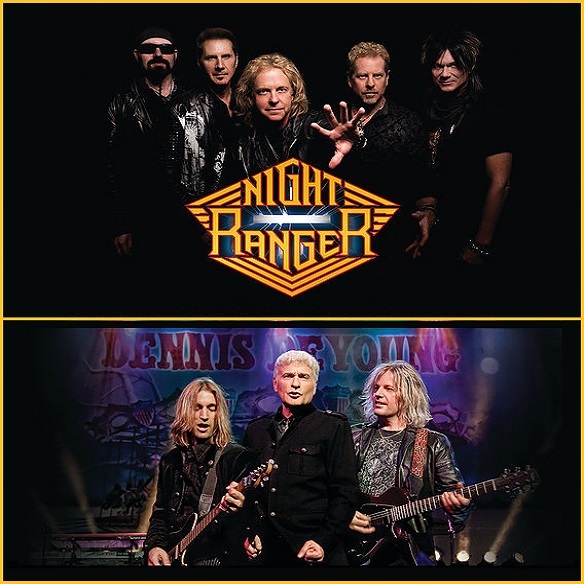 The staff of Night Ranger & Dennis DeYoung will have some truly special merchandise for you to add to your collection and extend the memories of the night. We will have sales of your favorite adult beverages, along with plenty of cold water and colas to quench your thirst. Fair prices and fast service. When you attend a Scamp Entertainment event, you are the focus of the show and we seek to provide you a fun time without the hassles and headaches. Be sure to visit our booth to acquire some of our limited edition, branded goods that will add to the fun. Our products are quality and creative. A Panama City, Florida Events Company. Scamp Entertainment © All Rights Reserved.